This case report describes the successful use of medical acupuncture, electroacupuncture, photobiomodulation and physical rehabilitation as therapy for a canine showing signs of right forelimb paralysis and conscious proprioception deficits after sustaining brachial plexus trauma secondary to a dog fight. The patient was examined weekly for changes in use and sensation of the limb. Over the course of 6 weeks of therapy this patient has regained the ability to bear weight on the limb and demonstrates the ability to appropriately place the limb indicating that these modalities should be considered for therapy in cases of pain and forelimb neurological dysfunction. A 7-year-old, female spayed, Welsh Corgi weighing 13kg presented to the State Avenue Veterinary Clinic as a walk-in emergency with a history of being attacked by a Great Dane immediately prior to presentation. There was no previous history of illness or injury. On physical exam, all vitals were within normal parameters and she was bright, alert, and responsive. The dog was very painful registering a 3 of 4 on the Colorado State University Canine Acute Pain Scale showing signs of tension when resting and was vocal when moved1. There was an approximately 20cm linear laceration through the right axillary region with minimal hemorrhage, but dried blood was present on the right forelimb. She was non-weight bearing (NWB) on the right forelimb and had no reaction to deep pain stimulation of the paw. The patient was sedated with Dexdomitor and butorphanol to allow for exploration and cleaning of the wound, radiographs, and closure of the wounds with Penrose drain placement. No fractures were noted. Exploration of the wound revealed torn musculature, pain on deep palpation of the region and increased medial shoulder instability. The dog was given intravenous fluids, buprenorphine, and ampicillin while hospitalized for the afternoon and then was prescribed carprofen, gabapentin, and cephalexin to go home. Six days after her initial presentation the dog presented for acupuncture and rehab therapy. Her physical exam at this time showed vital parameters within normal limits. The laceration was healing well, there was no longer any discharge exuding from the drain and it was removed. The skin appeared healthy around the drain exit sites and laceration, minimal bruising was noted. She was non-weight bearing on the right forelimb and showed signs of pain on extension of the shoulder; the shoulder had decreased range of motion (ROM) and she was painful on palpation of the axillary region and the lateral thorax near the axilla. The patient’s pain level was rated 1 of 4. She was showing no signs of voluntary movement of the limb at home or during exam. She did attempt to bite when both the injured and non-injured paws were touched, but we do not believe she was painful on palpation of the paws, simply behaviorally reactive. Upon testing the conscious proprioception (CP), table placement, and deep pain the patient showed no normal neurological responses. The patient consistently stood with the paw abnormally placed bearing weight on the dorsal surface of the paw, did not elevate the limb when approaching a table top to place the limb on the table surface, and did not show evidence of feeling when the interdigital skin was pinched. She was able to ambulate well, walk and trot smoothly, on her three uninjured limbs. Myofascial exam indicated pain on palpation of the latissimus dorsi and the pectoralis profundus muscles on the right and tension was noted in the cleidobrachialis, deltoid, infraspinatus, and triceps muscles of the left forelimb. Neck ROM was within normal limits and the left forelimb had normal ROM and neurological function. She was very nervous during exam and had no interest in a variety of treats. The definitive diagnosis for this patient is brachial plexus avulsion with secondary muscle and skin trauma. The avulsion is caused trauma to the musculocutaneous nerve, radial, ulnar, median, and axillary nerves leading to clinical signs at time of presentation. We were able to rule out other differentials due to successful recovery and lack of underlying disease. There are some differentials that may be considered plausible, but are secondary to the brachial plexus trauma. This owner elected to do traditional medical management along with alternative therapy. Due to the owner’s work schedule we scheduled once weekly sessions of acupuncture, laser therapy, and rehab therapy with this dog. The dog continued to take oral gabapentin and carprofen throughout these treatments. Seren needles of 0.2 gauge and 15mm or 30mm length were used during this patient’s initial appointment, eventually Hwato needles of 0.3 gauge and 15mm length were used for electrotherapy. The seren needles were the smallest size needle available within the clinic. Very few points were used at the first appointment due to the dog’s anxiety; the points achieved were GV 14, BaiHui, GV 20 and paired BL 12 and BL 13. These points were chosen to target the patient’s anxiety and the central nervous system in the area of the origin of the injured nerves. 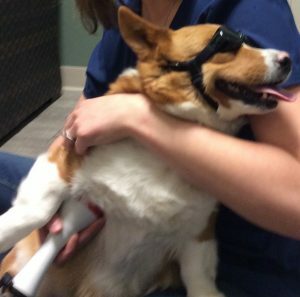 Laser therapy using a Companion Animal Laser at a setting of 10 watts was performed for 6 minutes around the axillary region and painful areas in the latissimus dorsi and the pectoralis profundus muscles as well as the neck on both the right and left sides and extending distally to the right front paw at each appointment (see figure 1). Laser therapy was performed around the site of trauma to increase blood flow and aid in increasing the rate of healing and decrease pain. Laser therapy was continued down the entire injured limb to stimulate blood flow, anti-inflammatory mediators, and stimulate the distal acupuncture points that we were unable to stimulate with needles due to the patient’s anxiety. After the initial acupuncture visit it was noted that the patient was much more tolerant of acupuncture needle placement if it was done after the laser therapy, it appeared that the patient was more relaxed after laser therapy. At subsequent visits the following acupuncture points were used: GV 20, GV 14, Baxie, SI 11, SI 12, LI 4, HT 7, HT 8, SI 3, KI 3, LI 4, LI 11, LI 10, TH 10, TH 14 and regional cervical trigger points bilaterally as well as paired BL 12, BL 13, and GB 21 (see figure 2). Electroacupuncture was performed using a ITO ES-130 unit set at 80-100Hz and 2.5-5.5Hz for 3-4 minutes at a time from TH 10 and TH 4. These specific acupuncture points were chosen as lay along the nerves of the forelimb that were affect by brachial plexus trauma, including the radial, suprascapular, ulnar, and median nerves. The radial nerve was specifically targeted due to its role in innervations of the extensor muscles of the forelimbs which was very important for long term use of the limb. The Baxie points were targeted to try to stimulate distal nerves to encourage proprioception. 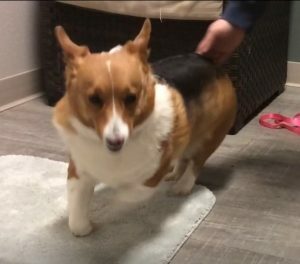 Massage of the right and left forelimb extensors, flexors, and digits was used during the appointment to help train the dog to allow for handling of the limb and paw as well as to stimulate blood flow and nerve transmissions, decrease muscle tension, and stimulate myofascial release. After the second acupuncture and laser therapy session the dog had started bearing weight on the limb at home so we were able to start rehab and physical strengthening therapies. Cavalettis were used at 1” height and digit stimulation was encouraged with a partially deflated spiky disc for the dog to walk across and stand on. This patient was very difficult to motivate and continued to have minimal interest in a wide variety of treats, chews, and human foods. This dog continued to show improvement in ambulation and use of the limb at each of the six acupuncture and rehabilitation appointments. At this time, she is bearing weight and able to lift the limb to step over the cavalettis, CP deficits do remain for the right forelimb, but she only drags her nails and missteps when ambulating when fatigued. She shows no signs of pain on extension of the right forelimb and no pain on palpation of the axillary region resulting in a pain score of 0 of 4. The owner will continue to practice with cavalettis and perform manual stimulation of the paw at home, but she is very happy with how the patient has recovered and we plan to follow-up with acupuncture only as needed for pain management. The goal of using acupuncture and electroacupuncture in this patient was to decrease pain, increase transmission of neurological stimulation through augmentation of nerve regeneration, decrease local inflammatory reactions, and provide some protection again further motor neuron death2, 6, 3. I learned that follow-up electroacupuncture sessions may have been more effective if I would have considered an arc from TH 14 to either TH 10 or TH 4 to try to span the area of radial nerve trauma. I should have also focused on autonomic points and considered the addition of ST 36, LR 3, and PC 6 which would have been used to stimulate the autonomic nervous system and decrease anxiety. Laser therapy was used to decrease pain, inflammation in this patient while promoting axonal growth, myelinization, and decreasing degeneration of damaged motor neurons4. Laser therapy has been shown to have beneficial effects such as faster regeneration and faster return to function when used on nerve lesions5. Changes that will be made during future laser sessions will be to use different wavelength power when targeting muscle tensions versus pain associated with severe muscle and skin trauma versus target neuron regeneration and preservation. 1. Hellyer PW, Uhrig SR, Robinson NG. Canine acute pain scale and feline acute pain scale. Colorado State University Veterinary Medical Center, 2006. 2. Liu H, Qian XY, An JX, Liu CC, Jiang YD1, Cope DK, Williams JP. Analgesic Effects and Neuropathology Changes of Electroacupuncture on Curing a Rat Model of Brachial Plexus Neuralgia Induced by Cobra Venom. Pain Physician. 2016 Mar; 19(3):E435-47. 3. Luo H1, Cheng X2, Tang Y1, Ling Z1, Zhou L1. Electroacupuncture treatment contributes to the downregulation of neuronal nitric oxide synthase and motoneuron death in injured spinal cords following root avulsion of the brachial plexus. Biomed Rep. 2014 Mar; 2(2):207-212. 5. Rosso MPO1, Buchaim DV2,3, Kawano N4, Furlanette G5, Pomini KT6, Buchaim RL7,8. Photobiomodulation Therapy (PBMT) in Peripheral Nerve Regeneration: A Systematic Review. Bioengineering (Basel). 2018 Jun 9; 5(2). 6. Tang YJ1, Wu MH2, Tai CJ3. Direct electrical stimulation on the injured ulnar nerve using acupuncture needles combined with rehabilitation accelerates nerve regeneration and functional recovery-A case report. Complement Ther Med. 2016 Feb; 24:103-7.